With the host of advanced features, the Kobra 240 SS2 Multipurpose Office Strip Cut Shredder is a great product to invest. This basic strip cut office shredder is efficient and powerful. You can use this advanced strip cut shredder for destroying paper, paperclips, staples, and credit cards. The 240 SS2 Strip Cut Shredder by Kobra is supported by a heavy-duty chain drive having steel gears. While the automatic start/stop function makes this operability of the shredder a breeze, the carbon hardened cutting knives assists in easy cutting. This level-3 security shredder cuts material into 3/32-inch strips. The Multipurpose Office Strip Cut Shredder by Kobra has a capacity of shredding shred 15 sheets at once with a maximum speed of 22 ft. /min. 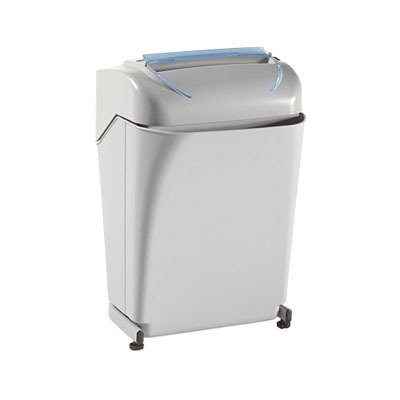 With 9.5-inch throat size, the shredder can easily handle numerous standard sized documents. Its thermal protected motor ensures continuous operation by preventing overheating. Further, to avoid the paper jam, this shredder also has an auto-reverse mechanism. Dimensions (WxDxH) 14.5" x 13" x 22"